The kitchens at the Hilton are buzzing with creativity. Every time I’ve dined there, there has been something that’s always caught my eye and my imagination. Few restaurants serve food with as much panache as the Ministry of Food. Part of the credit definitely goes to Chef Anirban Dasgupta, who seems to take pride in turning the ordinary into something extraordinary. A Street Food Fest centered around an Asian theme (including the Indian subcontinent) served as a perfect backdrop to showcase his craft. Weekday lunches are a good excuse for some theatrics, no? Small Plates, Medium Plates, Noodle Plates and Sweet Plates – the menu was fairly straight forward, though on further inspection it revealed at least one element in each dish which was a MOF twist. We were offered a sampling across sections to satiate our curiosity, starting with an unexpected drink – Ragi Malt! 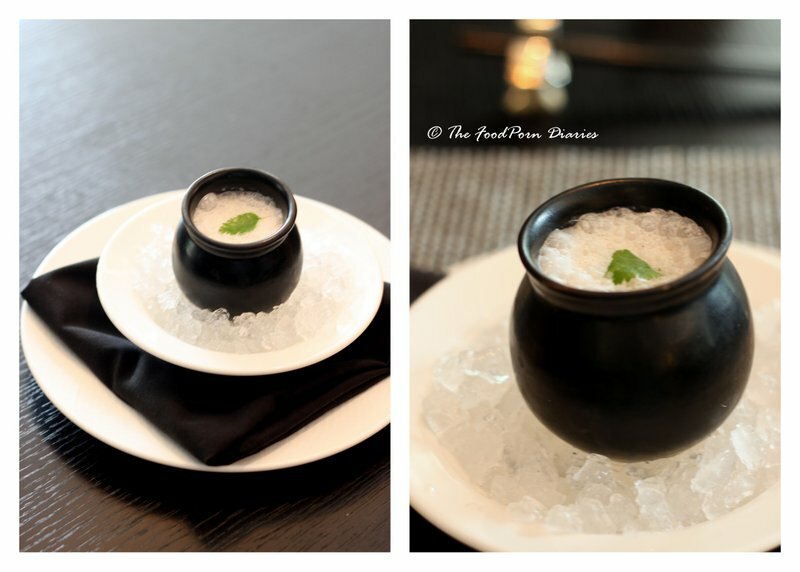 A chilled Ragi and Buttermilk beverage was the last thing to expect at the Hilton and more delightful because of that. 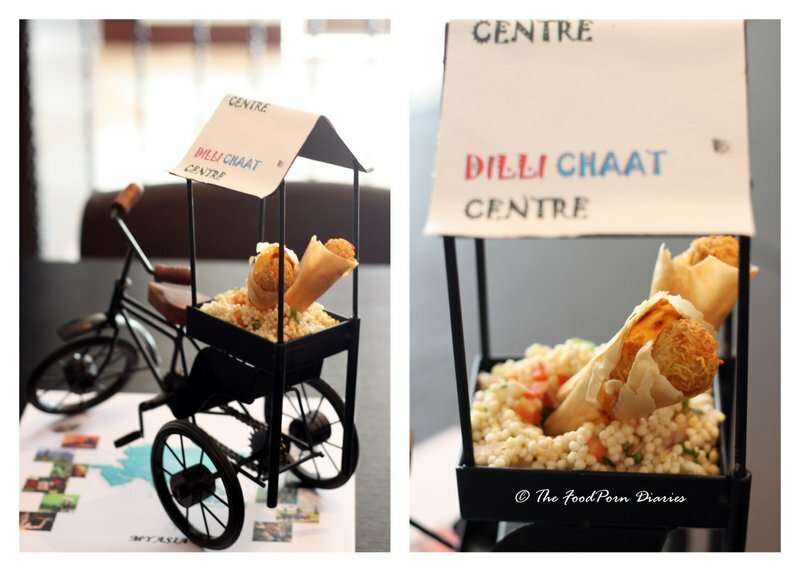 The very fun Chaat Cart is literally a mini cart complete with a mini bicycle. The Chandini Chowk inspired set-up offers Shakarkandi Chaat in filo cones and a Sabudana Jhalmuri. The Jhalmuri stole the show with its pungent mustard oil and the hit from thinly sliced green chillies. Satay is street food de riguer – an Indonesian specialty. This version however was inspired by Selangor, the Malaysian city and served on a coal smoked plate set on a large black bowl that vaguely resembled an ashtray. The effect was stunning to say the least and it tasted like Satay should – smoky, juicy and spicy. The Ragi Dhokla was a revelation. 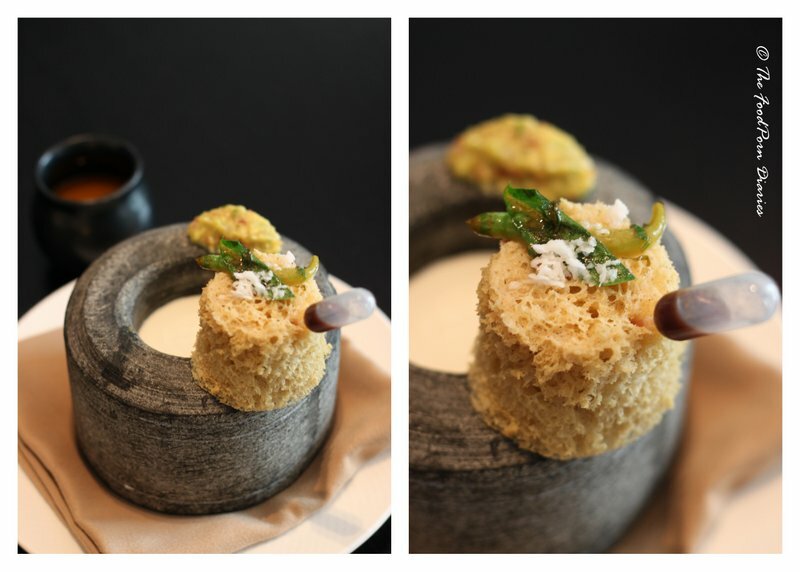 The softest, fluffiest Dhokla (courtesy some crazy nitrogen technique) sat precariously on the edge of a gorgeous mini grinding stone filled with creamy dahi. A little dropper containing tamarind chutney and an avocado Koshambir completed the accompaniments. I hate to attribute every Gujarati addition in the menu to PM Modi, but this one definitely stole the show. All political connotations aside, the little pot containing the essence of rasam was superlative in its own right, but really had no business being in the same frame as the Dhokla. 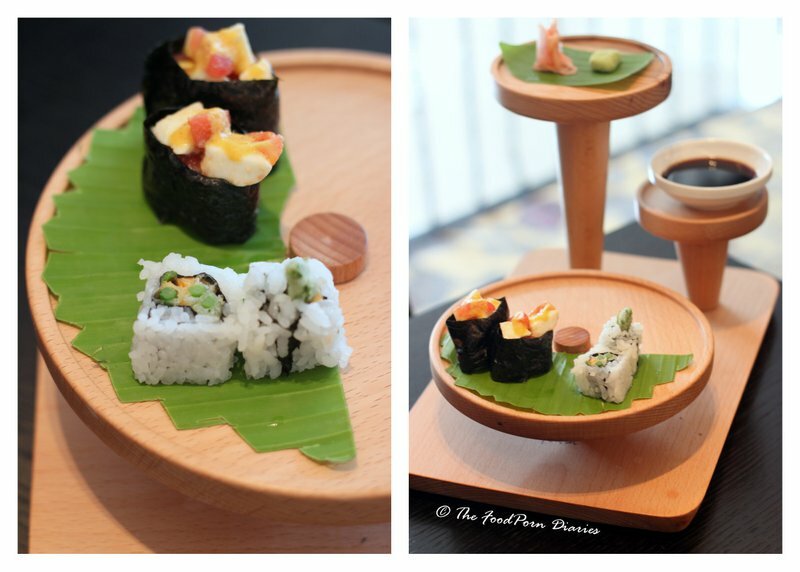 The 3D Sushi plate, offers you Spicy Tuna Nigiri and Inari Caprese in a three tiered plate. Apart from the fact that the serving plate is custom designed from Channapatna, there is nothing more that captured my fancy here. Maybe because I’ve been spoilt recently by the best Japanese Food I’ve had in my life (that’s a story for another time) or that I thought the portions were quite ridiculous for the price – this one is not on my reorder list. What was definitely on my reorder list was the Peking Chicken Reinvented (sounds Yoda-like, no?). 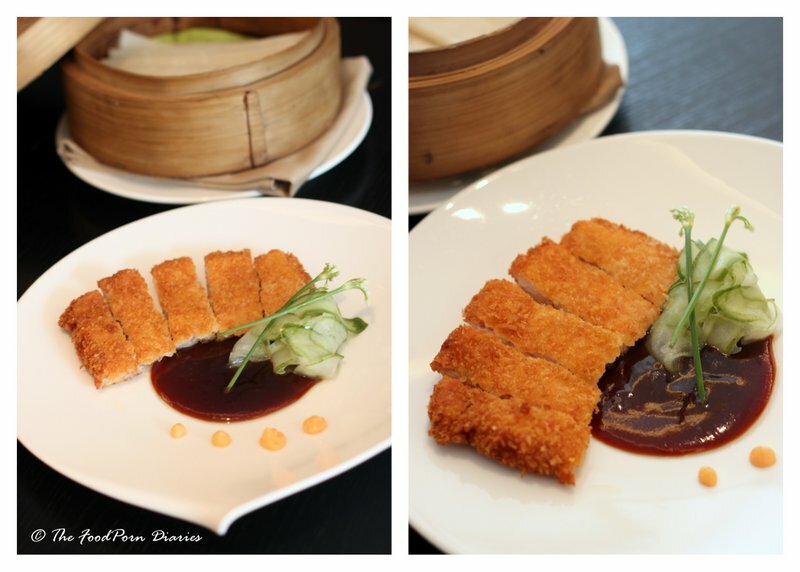 Japanese Crispy Fried Chicken (Torikatsu) served with lace like pancakes, Hoisin sauce and Cucumber tagliatelle. The chicken especially was all kinds of glorious with the perfect deep fried crumb and moist interior. I could pancake myself into heaven with this one. The next took me some time to understand – Bao Bhaji. Was it a Bao? Was it a Bhaji? Was it Chinese? Was it Indian? 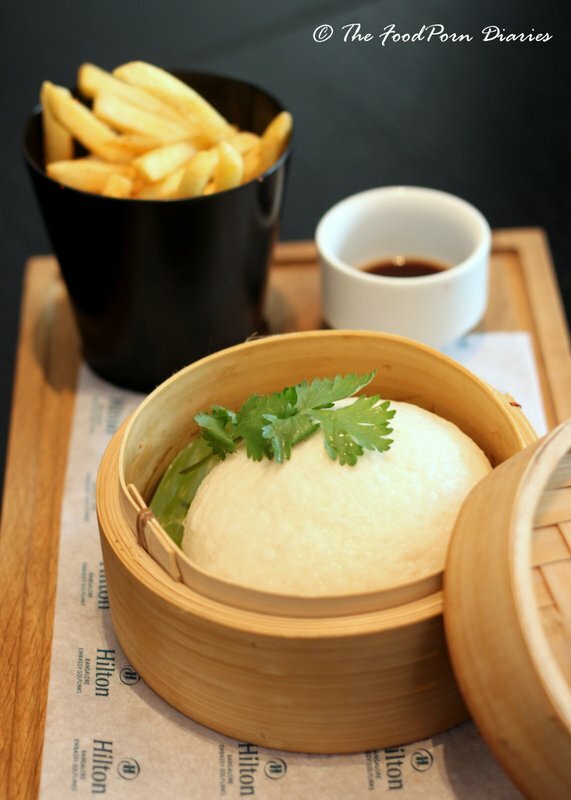 An almost perfect Bao stuffed with bhaji and steamed, served with tamarind chutney and togarashi fries. The bhaji masala was quite overpowering for the delicate Bao and the French fries completely threw me off, before someone explained the “Bao Burger” concept to me. So after much deliberation I need to conclude that this Bao definitely had an identity crisis. Keema Martabak is almost a National obsession in Malaysia. 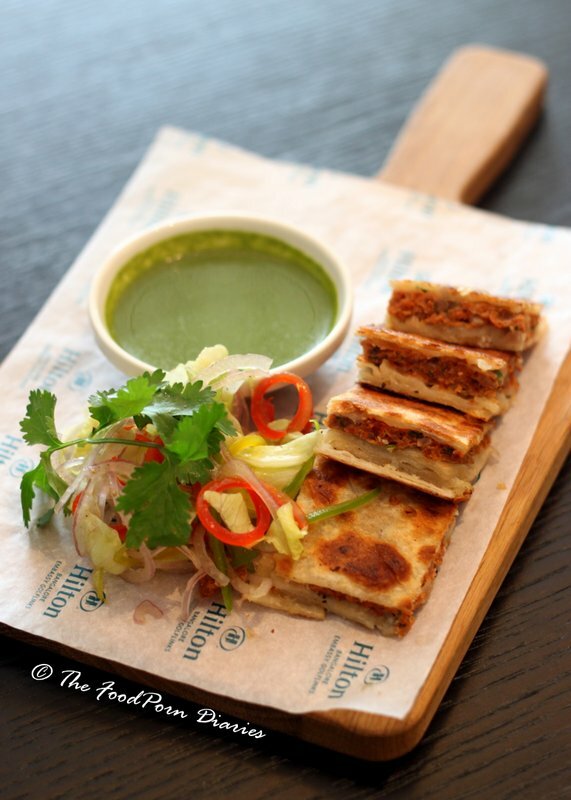 Crisp and flaky parathas stuffed with the most delectable minced lamb and egg mixture are always the rage for a quick fix. The MOF version almost nailed it, but a flakier paratha would have definitely scored full marks. We skipped the Noodle Cart (Mee Goreng, Shitake and Miso Ramen and Boat Noodles) straight to the Sweet Plates for lack of space in the tummy. Asian desserts are funny things – taste and texture wise. But no one can deny that they look absolutely beautiful. 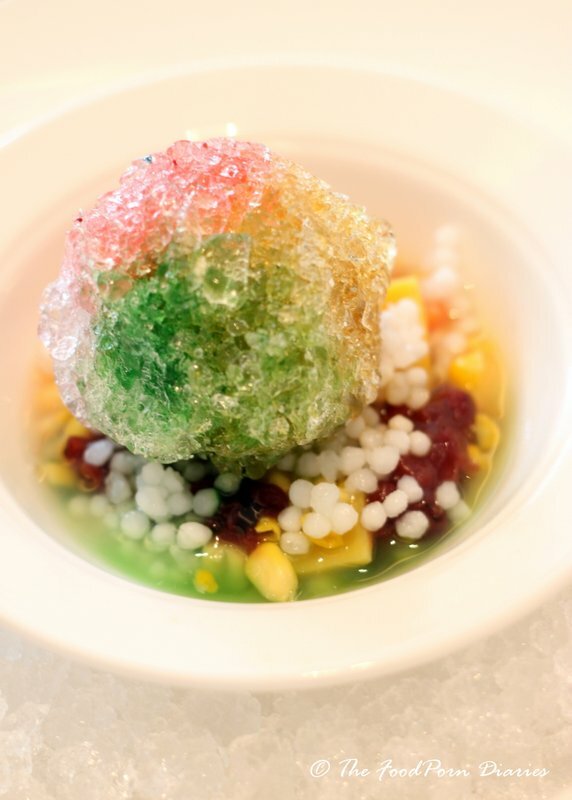 The Ice Kachang with Sago, Jackfruit, shaved ice and Palm Jaggery Ice Cream was a stunner but a couple of spoons into it and you’ve probably eaten enough odd shaped jelly and beans than you bargained for! The Asian Food Cart Festival offers a fun and sprightly selection of street food presented with the most creative plating techniques I’ve seen in a while. While each individual item might seem expensive compared to their actual street food counterparts – I found the set option very compelling. Pick one item, from each of the sections (Small plate, Medium Plate, Sweet Plate) for Rs.1200 (non-veg) and Rs.1000 (veg). The festival is on till the 7th of Dec at their all day dining restaurant – Ministry of Food. Don’t focus excessively on the photos. The write-up is more important. If the pics are unsatisfactory, you can select the best, reduce size and put them 4 in 1 tableaus and such like to ameliorate the visual effect -but you’d probably have already thought of that. Congrats on the new online space and end-name. 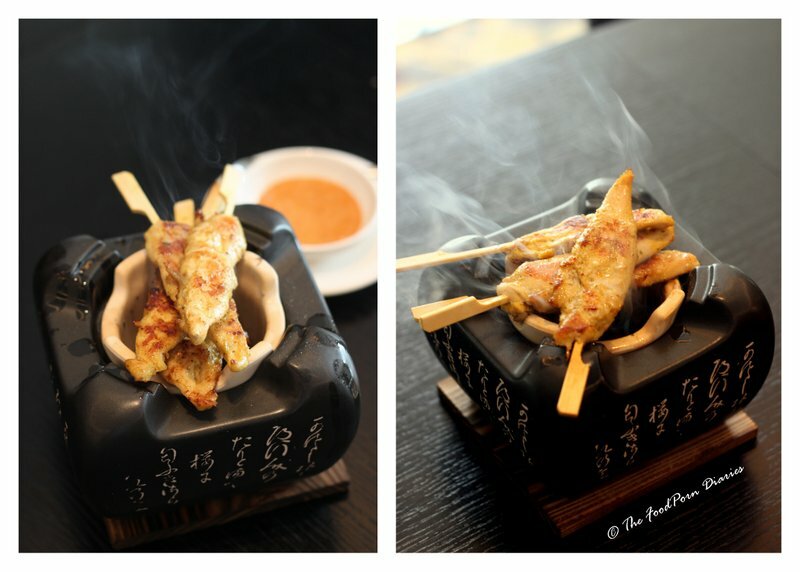 Had an interesting time going through post – what is it with Bengali chefs doing fancy tweaks with Nippon cuisine?! (Vikramjit Roy’s session in B’ore last year had me hooked) Waiting for your “best Japanese” write-up which you mentioned. Thank you… the Best Japanese Write up might have to wait. It was in a recent trip to Bangkok. Have the worst pics from the mobile phone.. so reluctant to post.